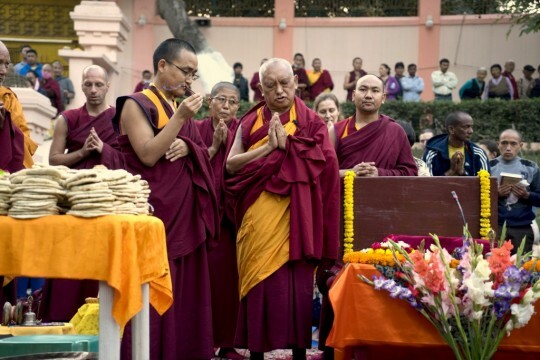 Lama Zopa Rinpoche, Mahabodhi Stupa, Bodhgaya, India, March 2015. Photo by Andy Melnic. One very good thing is that when you put your hands together to prostrate, visualize your body huge like a mountain range and think that you are prostrating with many bodies from all ten directions to the lam-rim merit field which has the 35 Buddhas there. Or, just to the 35 Buddhas. Or, even just to Buddha, but, the numberless direct and indirect lineage lamas; the numberless deities of four classes of tantra; the thousand buddhas of this fortunate eon; the bodhisattvas; the 16 Arhats and so forth; the dakas and dakinis and Dharma protectors are all in the Buddha whose essence is the guru. One is many and many are one. Then, visualize bodies filling all the Earth prostrating from all directions, huge bodies like a mountain range. If you have received the initiation of 1000-Armed Chenrezig, you can visualize that, if not, then just your ordinary body. If you visualize like that, you get the same merit as having done that many prostrations with that many bodies. This is specific advice from Lama Tsongkhapa – the way to collect the most extensive merit. Regarding your question on tantra, any of the lower tantra initiations are OK. That’s very good. And I want to say billion, trillion, zillion times thanks now that you have no fear and your mind is developed and you are making your life most beneficial – especially most beneficial for your parents – not only to be free from the oceans of samsaric suffering, but also to achieve the peerless happiness of enlightenment. It is so good that you are inspiring others and also inspiring your psychiatrist to learn meditation. I wish that all the people in the world who create negative karma like this would change and make their lives better, more meaningful for those people who get killed.